This week we are featuring the archaeology of Monroe County. This county was established in 1836 from parts of Northampton and Pike counties. It takes its namesake from James Monroe, fifth president of the United States (1817-1825). Located in the Pocono Mountains of northeastern Pennsylvania, the county is home to more than 139,000 residents. Bordered by six counties and the Delaware River it is one of the most picturesque regions of the Commonwealth. Driven by an active resort industry, Monroe County is a favorite area of vacationers throughout the year where the Pocono International Raceway, “the roadside strip” and the county’s many ski slopes are among its attractions. Two higher institutions of learning are also located in Monroe County – Monroe County Campus of Northampton Community College at Tannersville, Pennsylvania and “on the Upper Delaware” East Stroudsburg University of Pennsylvania at East Stroudsburg, Pennsylvania. Monroe County is largely contained in the Glaciated Pocono Plateau and Blue Mountain Sections of the Ridge and Valley Province with a smaller region in the Glaciated Low Plateau Section. These sections were once covered by thick ice deposits many years ago. The Lehigh and Delaware River systems with their numerous tributaries drain Monroe County and many of the smaller tributaries emanate-originate from bogs and freshwater lakes – products of the last glacial period. Twelve thousand years ago these water rich environments were home to numerous different plants and animals-including mastodons, an elephant-like animal, now extinct. One of these creatures was accidently discovered in 1968 when an employee of the Lakeside Peat Humus Company in Marshalls Creek, Monroe County snagged the skull with his dragline bucket. With the permission of the land owners John and Claire Leap, local volunteers and staff from The State Museum of Pennsylvania) recovered over 90% of the mastodon buried by three feet of peat and muck. Its two massive tusks of ivory were never found in spite of a diligent search for them. Radiocarbon dating of the bones indicate that the beast perished more than 12,000 years ago at about the time Paleoindians were spreading across the Northern Hemisphere. A search of the Pennsylvania Archaeological Site Survey (PASS) documents 234 prehistoric and historic archaeological sites in Monroe County. This is one site for every 2.61 miles and the majority of these are prehistoric (n=201) versus historic (n=62). In terms of topographic settings for these sites the numbers are about evenly split between riverine (n=81) and upland (n=62). 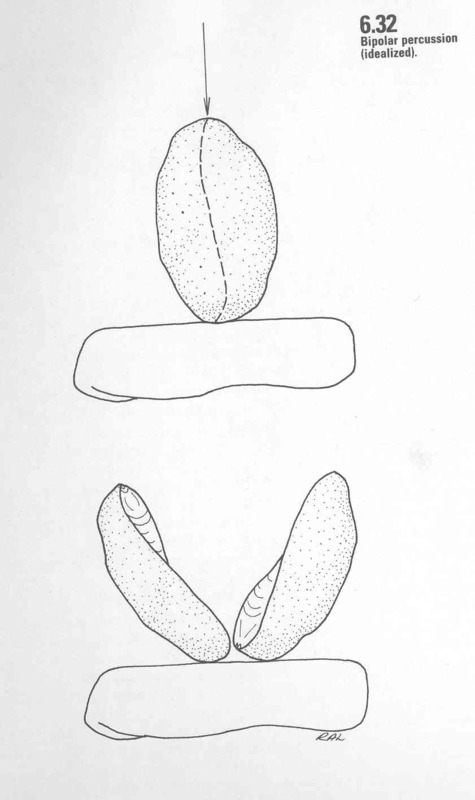 Lithologically, there was a prehistoric preference for the use of chert and jasper for all diagnostic point types. Late Archaic and Late Woodland sites dominate with Middle Archaic and Transitional sites equally represented. These were followed by Early Archaic and Middle Woodland and Paleoindian and Early Woodland in that general order of frequency. Some of these sites were reported and dug by amateur archaeologists interested in documenting their locations and the artifacts found on them. Additional site surveys were conducted by Penn DOT, the Army Corps of Engineers and the national Park Service. One of the largest surveys was conducted by Dr. W. Fred Kinsey of Franklin and Marshall College between 1964 and 1972. This work was performed in preparation for the Tocks IslandReservoir project and included the testing of 11 sites and the recordation of many more, between the Delaware Water Gap in the south and the town of Matamoras in the north. Interestingly, although the river is part of a National Recreation area, the controversial dam was never built. The major sites in Monroe County were Camp Ministerium (36MR8) and Camp Miller (36MR12). These produced multiple prehistoric occupations dating to the Late Archaic (6000 – 4300 years ago) and Woodland (2700 years ago – 1500 AD ) periods. At Camp Ministerium a total 3600 square feet were excavated. In this area archaeologists mapped and excavated a total of 32 basin and cone shaped pit features and three cobble lined hearths. These features were scattered across the site but no house patterns or activity areas such as corn processing could be identified. Twenty nine features yielded artifacts, the greatest percentage were classified as broken pottery sherds and projectile points. Most of the pottery was associated with the Late Woodland Period. The Owasco style (see below) or type was the most common, along with later types known as the Tribal series because they are associated with historical/ethnographically known tribes from the region. 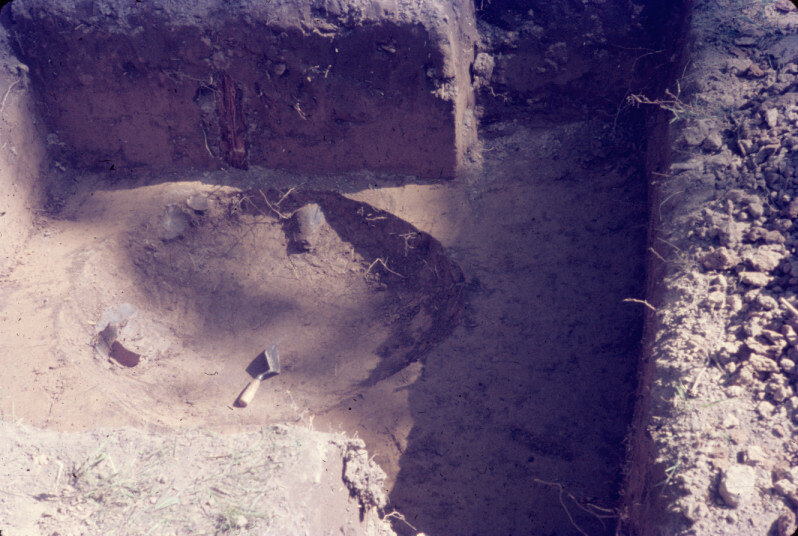 At Camp Miller, thirteen pit features and scattered postmolds within an 1800 square foot excavation area. As with Camp Ministerium, the features at Camp Miller appeared scattered over much of the site although the larger and more productive features were near the western end of the excavation. Again, pottery of several Owasco types was present, though Tribal series pottery was not. Based on projectile points this site was also occupied during the Transitional (4300 - 2700 years ago) and Early Woodland (2700 – 2100 years ago) periods. In another large survey project, Penn DOT commissioned a site survey prior to road development in the Marshall’s Creek area, Monroe County. The survey found numerous sites used by prehistoric people to quarry chert for the production of stone tools. The chert is found in relatively thin layers in limestone. The quarries are small, very different from the jasper, metarhyolite and argillite quarries. Rather than digging holes into the bedrock, these sites illustrate how the chert was pried out of the limestone beds. The most intensively used quarries were found surrounding swamps and lakes which would have contained a variety of food resources. We hope you have enjoyed this journey into the archaeology of Monroe County. We encourage you to explore the archaeological heritage of your county either in past blog posts on this site, or through publications in such journals as Pennsylvania Archaeologist, The Archaeology of Eastern North America or the Journal of Middle Atlantic Archaeology. Join us next week when we search Montgomery County’s archaeological heritage through “This Week In Pennsylvania Archaeology”. 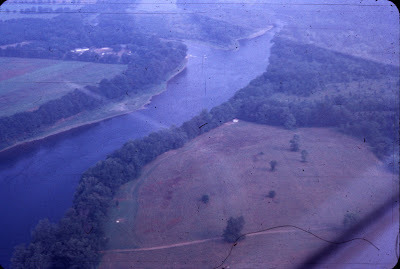 1972 Archeology of the Upper Delaware Valley: A Study of the Cultural Chronology of the Tocks Island Reservoir. Anthropological Series Number 2. The Pennsylvania Historical and Museum Commission. We are taking a break this week from our travels through Pennsylvania by county to report on our testing over the past two weeks at Fort Hunter. Despite the miserable weather, with no activities planned for the Mansion, it was a perfect time to dig up the front yard and continue the search for the elusive stockade trench and ditch that likely surrounded the fort. The discovery of these features would obviously simplify our efforts to locate other fort features. Anything dug into the ground, especially the size of a ditch or entrenchment surrounding the fort, should be visible as disturbed soil. Thus far, the exact location and dimensions of the fort have not been recorded in any documents that we have researched. General maps and descriptions place the fort on the south side of Fishing Creek and at the juncture with the Susquehanna River. This is also the most obvious location for a fort if it is to be easily accessible by boat and to have a commanding view of the river. Since beginning the investigation of the French and Indian War occupation at Fort Hunter, several excavation units have been opened east of the mansion towards the front of the house (hereafter denoted as the front yard) and north of the mansion around the icehouse (denoted as the backyard). This latter area has produced nearly all of the artifacts and features recovered so far dating from the mid-18th century. Over the years, several trenches have been excavated in the front yard but these produced few artifacts and the stratigraphy (layering of the soils) was complex and confusing. In 2011 and 2012, a road or ditch-like feature was discovered in the front yard. In cross-section, it appeared as if a thirty foot wide trench had been dug sometime in the past and later backfilled to be level with the present ground surface. We decided to investigate this area with additional backhoe trenches. Specifically, a number of test trenches were configured in order to maximize our ability to map the horizontal placement of this road/ditch feature. In addition, the front yard is a wide flat area that could produce other Fort related features and this was an opportunity to conduct a comprehensive survey of this area. With the indulgence of our hosts, Fort Hunter Mansion and Park, we excavated over 400 feet of trenches encompassing nine different locations. Our excellent backhoe operator, Corry Harner was accompanied by his nephew, Caleb Kickes and they were both excited to uncover new and interesting information about the history of central Pennsylvania. A total of nine trenches were dug running perpendicular and parallel to the river. The goal in placing these trenches was to fully expose the area surrounding our ditch/road feature in order to better define and interpret this feature. Additionally, these trenches allowed for further exploration of a line of soil auger tests (hand drilled soil testing device) implemented in the fall of 2012. Auger tests had revealed a natural profile, meaning undisturbed by historic activities. 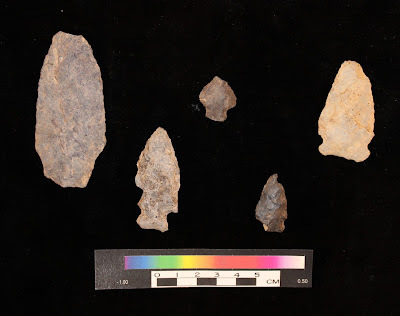 These auger tests produced a few prehistoric artifacts, including fire-cracked-rock, flakes and a Late Archaic (4300-6000 years ago) Brewerton side-notched spear point. Trenches placed along this line of auger tests revealed the presence of large rocks which may represent the remains of an historic structure that was possibly fort related. This trench was excavated over a distance of 120 feet to further investigate these rocks and aid in determining the limits of the road/ditch. Additional trenches were placed to investigate disturbances uncovered in our original trench that may be related to the stockade. The trenching produced some very interesting stratigraphy suggesting an oval shaped basin that is approximately one to three feet deep, 40 feet wide (east–west) and 170 feet long (north-south). The basin is defined by a layer of dark soil that slopes down in profile around its edge to approximately two feet deep in the center and lies on top of a gray sandy hardpan material. The deepest section of the basin measured less than 18 feet wide and approximately 160 feet long. The gray hardpan exhibits iron staining and in most places a ¼ inch thick layer of iron concretion marks the top of this soil. The gray color frequently represents a soil that was formed in a low oxygen environment such as under water and the iron deposits are also compatible with a surface that was frequently covered with water. Rusted iron artifacts, including an ox shoe and square cut nails were recovered at the top of the gray hardpan. Along the eastern edge of the depression we found a post mold in Trench #1. This discovery produced a great deal of excitement because it was very similar to the post molds that have been found in stockade trenches at other French and Indian War forts such as Fort Loudoun in Franklin County. The stain was very clear in the profile and the image of where the post had been placed was clearly defined by the edge of the post hole and two large cobbles that had been intentionally placed in the hole to support the post. Rocks used as supports for stockade posts are another feature common in stockade trenches. large cobbles at base of post mold. We called Corry in with his “mini-excavator” to remove the topsoil in an approximate ten foot unit around the post mold. Surprisingly, the post mold produced both prehistoric and historic artifacts but none from the mid 18th century. After extensive troweling and shoveling, only one other possible post mold was exposed. Alas! This does not appear to be a stockade line but we are unsure what it represents. Finally, numerous prehistoric and historic artifacts, especially heavily rusted nails and other rusted iron objects were recovered from the trenches closest to our 2011 trench. In contrast, the more southern trenches produced very few artifacts of either historic or prehistoric age. Based on the quantity of artifacts and features, most of the archaeology continues to be focused within 50 feet of the mansion. The sun illuminates our high school "shadow", Nick Beard. Dr. Frank Vento, a Geomorphologist from Clarion University of Pennsylvania, visited the site on 3/20/13. Based on a general description of the soils, he was able to summarize the formation of the stratigraphy in this section of the yard including the road/ditch feature. He concluded that the gray hardpan marks a ground surface that was exposed for some period of time probably during the 18th and early 19th centuries. He also noted that it was frequently covered with water thereby confirming our interpretation that it was this created in a low oxygen environment. Along with the presence of organic material, the soil overtime turned a gray color. The hard packed nature of the soil was likely caused by heavy wagon loads being rolled over this surface. According to Dr. Vento, this feature most likely represents a road. By the late 19th century, the depression was partially filled in by erosion from the surrounding sediments or by flooding. Later landscaping by the residents of the mansion completed the backfilling of this feature so that there is now no evidence of its existence on the surface today. As stated above, the most likely origin of the basin-like structure is that it was a road. Sometime, possibly during the 18th century, the road was dug through this area. It could be a product of the fort period or of the subsequent owners’ (Archibald McAllister). As well, it could represent the original road north along the river (the original route 322) noted on 18th century maps. The perplexing issue is why? Why excavate a 40 foot wide and two foot deep area for a road when the existing ground surface is relatively flat? This created a basin like structure that collected water as documented by the gray soil and iron deposits. Sections of the gray hardpan are layered or paved with pebbles possibly to create a more stable roadbed. However, other areas are not paved and this would have created a very muddy pathway causing problems for wagons. Based on the presence of historic artifacts at the bottom of the feature, the depression was filled during historic times. The co-mingled presence of large numbers of prehistoric artifacts in these soils suggests they came from the immediate vicinity and probably from the topsoil surrounding the basin. Another possibility is that the road-like feature remained open well into the early 19th century when McAllister filled it in by grading topsoil from the yard area around his house. This scenario would explain the relatively thin layer of topsoil that presently covers the front yard except in those areas over the depression where the topsoil is significantly thicker. As is usually the case in archaeology, excavation and analysis solve some problems but create others. Considering its location, this feature could have been used to haul supplies to Fort Hunter that were loaded onto canoes and transported to Fort Augusta at present day Sunbury. The road may lead to an entrance or gate into the fort. Therefore, it is important to recover artifacts that will directly date this feature because it could just as easily be part of the later (non-fort related) McAllister occupation. In addition, there is the nagging question of why dig a road that collected water? The mystery continues but we have a pretty good working hypothesis. The front yard was significantly altered through landscaping sometime in the past. It is possible that this process destroyed or at the very least modified the structural evidence of the stockade and ditch/entrenchments that surrounded the fort. The only place that has produced indisputable evidence of the fort is in the back yard and that will be the focus of subsequent investigations. The topsoil in this area contains high densities of historic period artifacts from the fort period and is also significantly thicker than the topsoil in the front yard. Here, the stockade and entrenchments may have been covered by later landscaping, hopefully preserving them for our discovery. In September, we will continue to follow the road towards the back yard in hopes of locating its destination and explaining why it was dug. This week our journey by county through the archaeology of Pennsylvania takes us to Mifflin County(MI) in central Pennsylvania. This county is in the middle of the Appalachian Mountain section of the Ridge and Valley physiographic province. This province is a belt of long, narrow wooded ridges and broad agricultural valleys that sweep diagonally through central Pennsylvania. The county’s defined boundaries reflect this topography. The county lies within the Susquehanna River drainage and is drained by the Juniata River. The major tributary is the Kishacoquillas Creek. The ridges are comprised primarily of sandstone while the valley areas are chiefly limestone bedrock. 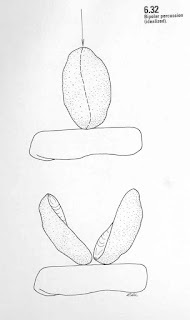 A significant number of caves, 59, have been recorded and are mainly located along the northwestern end of the Kishacoquillas Valley and scattered in the valley between Jacks and Shade Mountains. 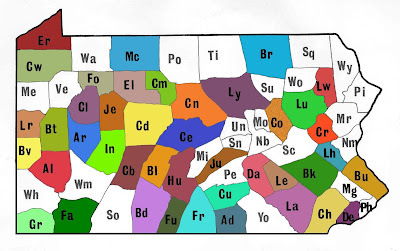 The main lithic resources are Shriver chert, found just to the north in Snyder County and Bedford chert found to the south. Metarhyolite is also common and originates in the South Mountain quarries in Franklin and Adams counties. The county has a relatively low density of archaeological sites and very few have been tested. 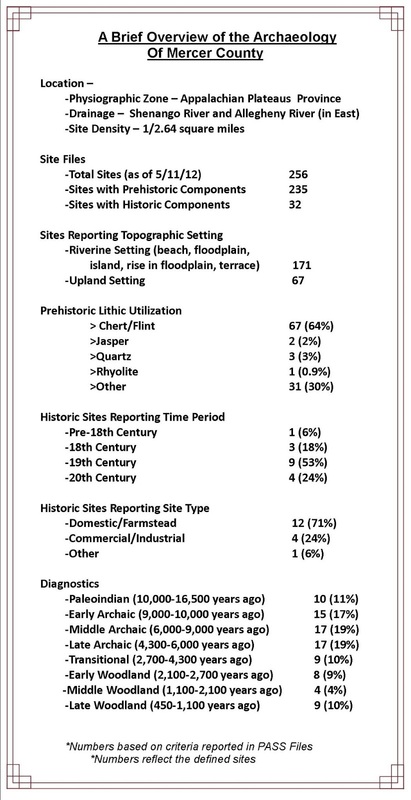 Eighty-four percent of the sites recorded are from the prehistoric period with every cultural time period represented, from Paleoindian (16,500-10,000 years ago) through the Late Woodland (1,100- 450 years ago). Systematic surveys conducted in 1976/ 1977 by the Pennsylvania Historical and Museum Commission (PHMC) provided information for some of the first sites recorded in this county. Working with collectors and their knowledge of the local terrain, several significant sites were recorded and provided previously unknown culture data for the Juniata Valley, which was beneficial in analyzing settlement patterns. 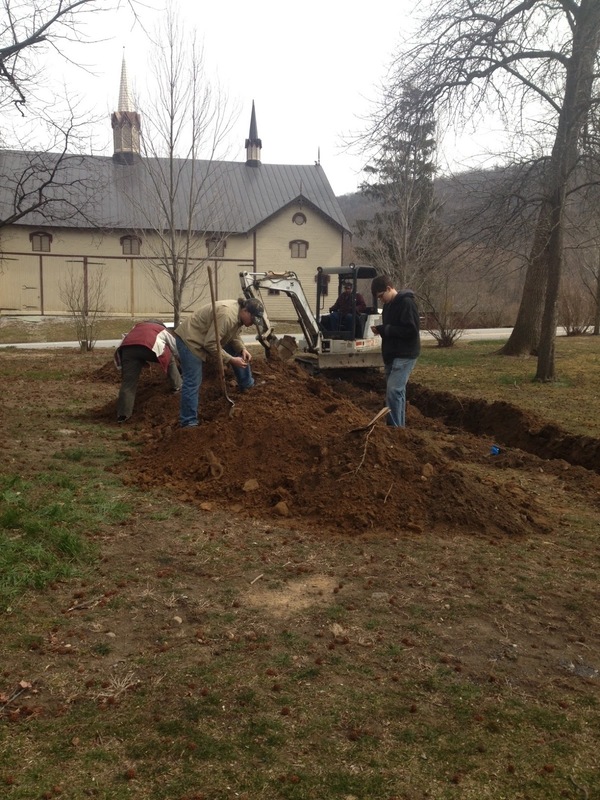 A recent archaeological investigation conducted by Heberling & Associates for the Lewistown Narrows project on S.R. 022 has provided archaeologists with a better understanding of lithic resources utilized in Mifflin County. The Lewistown Narrows are identified as a gap cut by the Juniata River through Shade and Blue mountains. Site 36MI92 is located on a terrace at the western end of the Narrows above the Juniata River. This location places it along an important transportation route utilized by Native peoples for thousands of years. Climatic changes which occurred approximately 4,000 years ago created warm, dry conditions and a shift in food procurement. At the end of the Late Archaic (4,300 years ago) we begin to see small garden plots of squash cultivated by Native peoples. This continues into the Transitional and Early Woodland Period (4,300-2,100 years ago) and intensifies as population increases and the nut-bearing forests produce less nuts and oaks fewer acorns. Archaeology conducted at other sites within the Juniata River Valley indicate that this region was not as affected by increased temperature and dry conditions as other areas of Pennsylvania (Raber). This may be a factor in the settlement patterns and use of this valley during a period when other areas were experiencing environmental stresses. The artifact assemblage recovered from 36MI92 was relatively small (511) which allowed for detailed lithic analysis of these artifacts. The collection is comprised primarily of lithic debitage. Debitage is the waste material produced in the process of making chipped stone tools, projectile points and scrapers are two examples of stone tools. Diagnostic tools of rhyolite and chert representing the early Middle Archaic period (6,000-9,000 years ago) through the Late Archaic (4,300- 6,000 years ago) were recovered. These artifacts are similar in cultural time period to those recovered just a few miles north at 36Ju104 which was also investigated during this transportation project. 36Ju104 was identified as a temporary camp utilized during long-distance and local travel through the region for procurement of lithic resources to replenish stone tool kits. Occupation during these episodes would last for a few days and would most frequently occur during the end of the Early Archaic (9,000-10,000 years ago) and the beginning of the Middle Archaic period. In contrast, 36Mi92 yielded evidence of a camp occupied for a period of weeks by small nuclear or extended families, possibly during spring or summer. The location of this site at the western end of the Narrows allowed for greater access to a variety of resources. The other notable difference observed was in tool production. The debitage recovered at 36MI92 indicates that activities related to tool manufacture likely occurred elsewhere where local cherts were utilized; as opposed to tool maintenance activities as indicated in the debitage recovered at 36Ju104. Heberling’s report examined settlement patterns in the Lewistown Narrows, specifically focusing on the Early and Middle Archaic periods. Heberling observed the role that the topography may have played in the procurement and settlement. They suggest that “ the Narrows provided a connection between two parallel systems of settlement, one focused on the Juniata/Kishacoquillas drainage to the west, the other on the Juniata/Tuscarora drainage to the east.” Base camps whose function was similar to 36Mi92 likely later developed into the Late Woodland villages and Contact period towns of the 17th and 18th centuries. Kishacoquilla a Shawnee chief lived at the Indian village, Ohesson, at the confluence of present day Kishacoquillas Creek and the Juniata River. An interpretation of the word by Heckewelder identifies this as an altered form of Gischichgakwalis meaning “the snakes are already in their dens” but no further explanation of this interpretation is provided. Historic documents place a Shawnee village of 20 families here as early as 1731. Kishacoquilla was present at the signing of a Treaty of Friendship in Philadelphia in 1739. He reportedly died in 1754, just before the French and Indian War would come to Mifflin County. Fort Granville was located just south of present day Lewistown. It was garrisoned from January 1756 until its burning in July of 1756. George Croghan erected this fortification under orders of the Provincial Commissioners. The orders specified for Croghan “to erect stockades fifty feet square with a block-house on two of the corners, and a barrack within, capable of lodging fifty men.” (Hunter) Fort Granville was one of three forts designated as part of a line of defense west of the Susquehanna. Provisions, including powder and lead, were scarce and reports in February of 1756 indicate that no flour or meal was available at the fort. Recruitment and retainment of troops during this period was difficult and it is during the spring of 1756 that Indian raids increase in the region. Thirty-nine men are recorded at Fort Granville in June of 1756, just one month before it was attacked. A change in command had left the fort poorly staffed and still low on supplies. The officer in charge, Capt. Ward, left the fort to travel to Carlisle for pay and provisions for the troops. While he was gone, the fort was attacked and burned. The officer in charge at the time opened the gates under the promise of protection from the attacking French and Indian forces. Twenty-two soldiers, three women and five or six children were captured. The French reportedly took the young men and women, the Indians the older men and children, as well as the flour. Fort Granville was not rebuilt and this weakness in the line of defense was of great concern to Pennsylvania’s militia. In September 1756, the defense system was reorganized and the garrisons reassigned on interior forts in Cumberland County. Construction of the Pennsylvania Canal on the Juniata River is believed to have destroyed any remaining evidence of the fort. The settlement of Mifflin County was directly impacted by the construction of the canal system. Navigation of the river allowed for easier transport of supplies and greatly increased commerce. Mills and furnaces sprang up throughout the region and the natural resources that had attracted Native Americans to this region thousands of years before, attracted colonists to the county as well. The widening project on S.R. 0022 through the Lewistown Narrows has opened up and improved, yet another transportation corridor into Mifflin County and will likely bring an increase in settlement to the area. We hope you have enjoyed this brief review of the archaeology of Mifflin County. 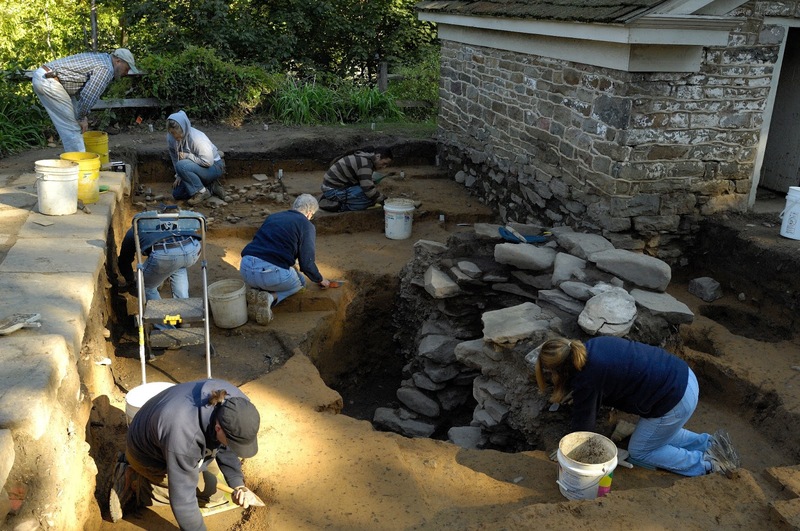 Understanding and exploring our archaeological heritage is pivotal to our understanding of human behavior and our ability to change and adapt over time- just as the peoples of Mifflin County have done for thousands of years. A History of the Indian Villages and Place Names in Pennsylvania, Wennawoods Publishing, Lewisburg, Pennsylvania,1999. Forts on the Pennsylvania Frontier, 1753-1758, Commonwealth of Pennsylvania, Pennsylvania Historical & Museum Commission, Harrisburg, Pennsylvania, 1960. Raber, Paul A., Jonathan A. Burns, Patti L. Byra, Brenda A. Carr, Nicole Cooper Minnichbach, Brian L. Fritz, Frank J. Vento. Phase III Archaeological Data Recovery Investigations, Sites 36Ju104 and 36Mi92, S.R.0022, Sections A09 and A11, Lewistown Narrows, Juniata and Mifflin Counties, Pennsylvania. Prepared for The Pennsylvania Department of Transportation. Heberling Associates, Inc. This week TWIPA lands in Mercer County in northwestern Pennsylvania. Mercer County is bounded by Crawford County to the North, Lawrence and Butler Counties to the South and Southeast respectively, and by Trumble County, Ohio to the West. Mercer County is situated entirely within the Northwestern Glaciated Plateau Section of the Appalachian Plataeus physiographic province, and is drained primarily by the Shenango River, although a small portion of the northeast corner of the county is drained by Deer Creek, a tributary of the Allegheny River. The topography of Mercer County has been described as having broad, rounded uplands and deep, steep-sided, linear valleys partially filled with glacial deposits. The majority of archaeological sites recorded in the county are prehistoric in nature, and are fairly evenly distributed across all time periods with the bulk falling into the Early, Middle and Late Archaic. Two and a half times more sites have been identified as having a riverine setting as compared to sites in upland settings. Lithic preferences trend heavily towards chert/flint which is not terribly surprising given the county’s relative proximity to both Flint Ridge and Onondaga quarry sources. 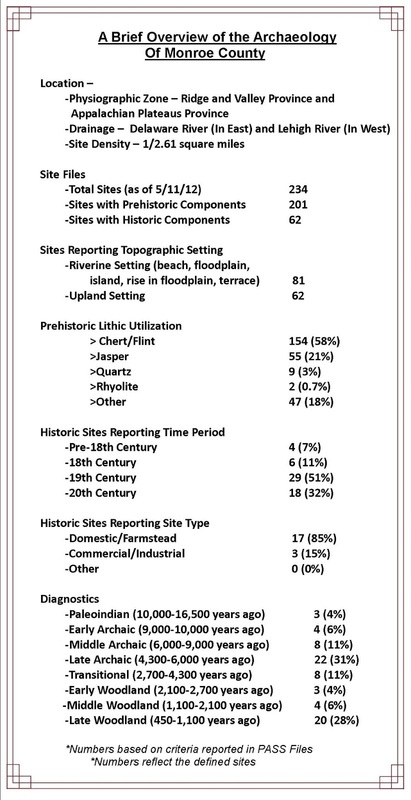 19th Century domestic/farmstead sites represent the lion’s share of registered sites identified as having a historic component. Mercer County falls into the western region of the commonwealth and these archaeological resources have been investigated and curated at the Carnegie Museum for many years, so much of our research is dependent on published references. 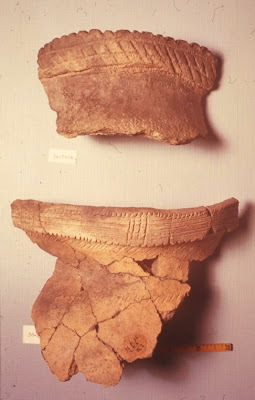 An archaeological survey of the Upper Ohio Valley conducted by William J. Mayer-Oakes, Field Archaeologist at the Carnegie Museum, provides some of the earliest references for the pre-history of Mercer County. Mayer-Oakes divided the Upper Ohio Valley by drainage basin and placed Mercer in the Beaver drainage. By visiting local collectors and conducting minimal testing, he was able to record thirty-one sites in Mercer County. Mayer-Oakes recorded fluted points representing the Paleoindian period (16,000-10,000 years ago) from fine-grained black chert and mottled blue, gray and brown chert. Artifacts representing small camp sites of the Archaic period included such stone tools as full grooved axes, adzes, bannerstones, birdstones and a boatstone. This comprehensive survey of sites included artifacts through the Woodland period (2,700 to 450 years ago) including shell tempered pottery and triangular points. Briefly mentioned is the 18th century historic Indian site of Pymatuning Town (36Me11). Lieutenant Thomas Hutchins who was a British officer surveyed and recorded the area north of Pittsburgh and produced a map in 1761 which records the site as Pematuning. Hutchins describes the village as, “15 Houses at Peymatuning last fall and consisted of 40 Warriors ...” Later maps show that the village existed for another fifteen years, although its exact location varied. In 1785 the area was surveyed by Andrew Henderson charged with laying out land plots for donation to Revolutionary War soldiers as payment for their service. Henderson noted that there would have been cabins, “but are long since destroyed by fire”. He suggests the site was abandoned by 1777, but it is generally agreed that this date was closer to 1778- sometime after the “Squaw Campaign” of March, 1778. 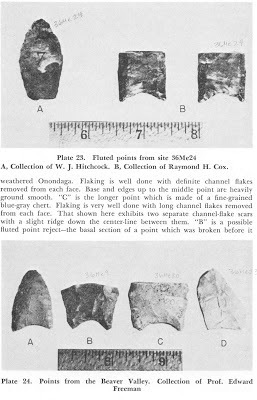 Archaeological investigations at Pymatuning Town were conducted first by Donald Cadzow in 1934 and later by Don Dragoo of the Carnegie Museum. Dragoo’s investigation successfully located the village area based on refuse pits filled with fragments of 17th century glass, china, pewter spoons and handwrought nails. Dragoo found that the area was heavily disturbed being previously dug by pot hunters. The investigation eventually located the associated cemetery, but it had also been vandalized. Dragoo confirmed Henderson’s observation regarding placement of cornfields on the bottomlands, ideal for crops and too close to the water for the village. The village and cemetery were located on a high terrace, protected from flooding. Interviews with local residents indicate that the evidence of looting had likely occurred in the 1890’s and was possibly associated with the burying of a farm horse during that period. Moving forward a few hundred years to the 1940’s takes us to the military site of Camp Reynolds (36Me243). This site was recorded during a pipeline project, one of several in which recent sites were identified. Recorded in Pymatuning Township this military camp was used both as a processing station for troops headed to Europe, but also as a German prisoner of war camp. The camp was initially referred to as the Shenango Personnel Replacement Depot, it encompassed 3300 acres and was operational from 1942 to 1944. Estimates of a million soldiers passed through this camp for processing before deployment during WWII. Its location along major rail lines facilitated timely troop movements to east coast ports. As noted, the site was used as a POW camp for German prisoners, housing up to 1800 occupants before closing in 1946. The majority of the structures were dismantled or turned into an industrial park for the community. Little evidence of the camp remains today, making the recording of this site archaeologically necessary for its future preservation. 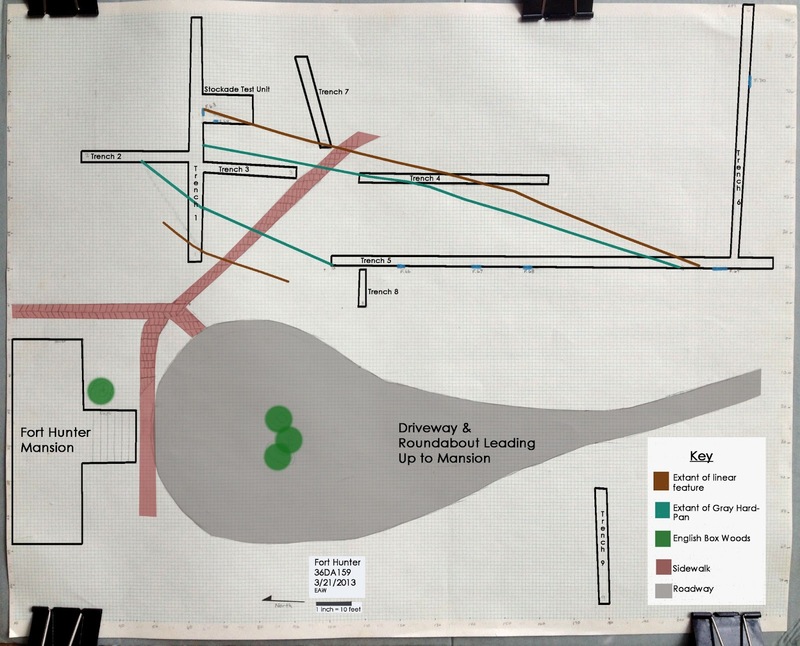 We hope you have enjoyed this brief review of the archaeology of Mercer County. Hopefully it will inspire you to seek such publications as, Prehistory of the Upper Ohio Valley, Indian Villages and Place Names in Pennsylvania or any of the journal articles on archaeology conducted in Mercer County and published in Pennsylvania Archaeologist. Understanding and exploring our archaeological heritage is pivotal to our understanding of human behavior and our ability to change and adapt over time- just as the peoples of Mercer County have done for thousands of years. Prehistory of the Upper Ohio Valley, (Anthropological Series, No. 2) Annals of Carnegie Museum, Pittsburgh, PA 1955. This week our journey by county through the archaeology of Pennsylvania takes us to northern Pennsylvania and McKean County. This county is mainly situated in the Deep Valleys Section of the Appalachian Plateaus Province. A small section of the High Plateaus Section extends into the southwest corner of the county. The majority of the county is drained by the headwaters of the Allegheny River. Major tributaries include Potato, Tunungwant and Oswago creeks. The region is characterized by steep-sided stream valleys and high, level ridge tops. Most of the county is upland in nature and this is reflected in site locations with 75% of the sites located out of the stream valleys. The main lithic resources are local chert and Onondaga chert from western New York. Although some Onondaga chert was the result of trade or people actually traveling to the quarries approximately 100 miles to the north to replenish their supply, much of this material was transported from western New York by glaciers. Onondaga pebbles are common in local stream beds where it was collected by Native American flint knappers. These pebbles were not easily held in the hand for flaking and they were shaped into tools by a technique called bipolar reduction. This is a very distinctive process that was commonly used in areas where raw material for stone tools was in short supply. It involves placing a pebble core on a relatively flat rock known as an anvil stone and striking the pebble on the top. This produces a flake that is battered on both ends. After repeated blows, an indention or pit is worn into the anvil stone. Bipolar cores and anvil stones are found in northwestern Pennsylvania and also in coastal regions such as on the Delmarva Peninsula where bedrock lithic sources are also in short supply. The county has a very low density of archaeological sites and very few have been tested. The rugged terrain is probably the main reason. The glaciers washed away much of the good soil so farming is not common. In addition, the lack of plowed fields makes it more difficult to find archaeological sites. Approximately 70 Phase I surveys have been conducted in the county but few discovered any sites especially those of the prehistoric period. Approximately 40% of the sites date to the historic period and 87% of these relate to the oil and gas industry that was very common during the late 19th century. A pipeline survey of the northern counties discovered sites in five counties but none in McKean. Many of these surveys were conducted by archaeologists working for the Allegheny National Forest. In one case, over 10,000 acres were surveyed resulting in the discovery of approximately 40 historic period sites but only one from the prehistoric period. In most cases, the sites were avoided or were considered not eligible for inclusion on the National Register of Historic Places and no further work was conducted. The low population density of McKean County (44.4 per sq. mile as opposed to 283.9per sq. miles across all of Pennsylvania) may be a factor in discovering these sites but this region seems to have had a low population density in prehistory as well. In addition to the low density of sites, the prehistoric database is particularly poor. 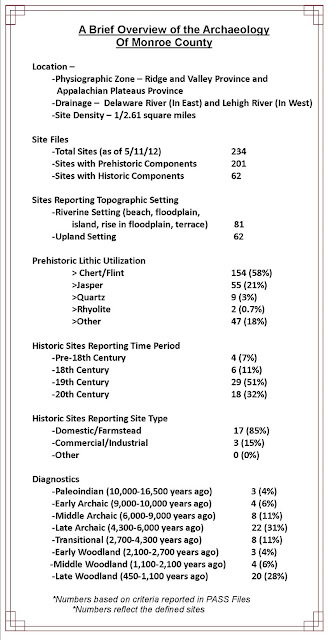 Only 18 of the 95 recorded sites produced diagnostic artifacts. There were no sites that produced diagnostic artifacts from the Paleoindian, Middle Archaic or Transitional periods. Interestingly, 31% of the sites are recorded as rockshelters. Rockshelters have been termed prehistoric motels. They were not necessarily used by large groups of people for long periods of time, but they were frequently used by small hunting parties exploiting upland settings or by groups moving between river valleys. Working in the Ridge and Valley Province, Paul Raber (2007) has suggested that during the Late Woodland period, trade and intertribal communication was important. There was an increase in movement between tribal groups and rockshelters were more frequently used. This is reflected in that 60% of the Late Woodland sites are in rockshelters. Due to the rugged nature of the county, historic settlement was slow. In addition, the elevations are high (1200-2000 feet above sea level) and the growing season is somewhat shorter. Early industries consisted of lumber and oil. Lumber was rafted down the Allegheny River and oil was being shipped to Baltimore as early as 1810. The oil business began to boom in the 1870’s and population increased five-fold during this time. We hope you have enjoyed this glimpse into the archaeological heritage of McKean County. Understanding and exploring our archaeological heritage is pivotal to our understanding of human behavior and our ability to change and adapt over time- just as the peoples of McKean County have done for thousands of years. 2007 Moving People and Resources Across Pennsylvania’s Prehistoric Landscape: Investigations at 36Ju104. Pennsylvania Archaeologist 77(1): 1-29.